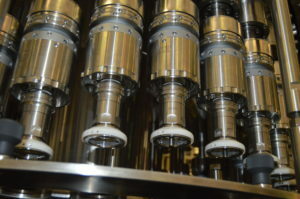 HC Model Proving to be a Reliable, Consistent Capping Option for USB Customers - US Bottlers Machinery Co. Earning a Reputation for Reliability and Consistency. The HC Capper is the current capping technology from U.S. Bottlers Machinery. 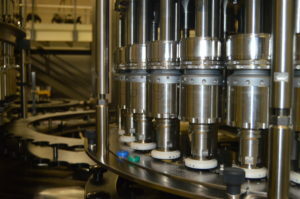 The contained cam rollers allow for a smooth, consistent operation, and ensure accurate alignment for cap to bottle engagement. The adjustable top load and non-cogging hysteresis magnetic clutches result in superior torque control and cap application. 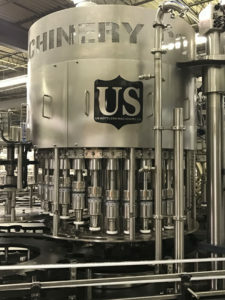 Bottle base and/or neck support options, along with the standard bottle belt system prevents rotation and enables the capper to handle lightweight bottles. The capping head assemblies are manufactured in corrosive-resistant materials, and can be easily removed individually for maintenance. Combining all of these features in a robust, Stainless Steel construction is delivering consistent high-speed capping performance in the field. This is supported by exceptionally low amounts of rejected containers throughout long production runs reported by our customers. In fact, it is not uncommon for inspection system data to indicate single-digit rejects on hundreds of thousands of containers run through the capper! As a result, the HC is building a strong reputation within the packaging industry as an exceptional capping solution. These machines are designed, assembled, tested and supported domestically in Charlotte, NC. Contact our Sales Department if you’re interested in obtaining a quote or acquiring more information on our HC Capper.